The Defender® Solar Panel Bird Spike prevents pigeons and other birds from gaining access under roof solar panels and solar water heating systems. This pigeon problem has plagued solar panel owners from the very start. The panels provide pigeons and birds with shelter and a high vantage point. Solar panels are becoming a popular energy generation system in the UK. In fact it is estimated that 10 million homes will have them by 2020. The knock on effect of this rise means that pigeon proofing these panels has become a priority. The Defender® Bird Solar Panel Spike has been specifically designed to prevent pigeons from nesting under solar panels. The panel spikes purposely do not touch the actual panel, which means there is no chance of the Defender® Solar Panel Bird Spikes invalidating the panel's warranty. All our Defender® spikes are designed and made by us, Jones and Son Pest Control Supplies, in Devon. If you are visiting the area and have a bird spike question, call in to chat with our friendly advisers and learn how our spikes are made. The Defender® Solar Panel Bird Spike is manufactured in strips of 33.4 cm (13 inches). Solar panels come in varying sizes and all the exposed sides must be protected with panel spikes to prevent pigeons from gaining access. The average solar panel is 1.5 metres long by 1 metre wide so to pigeon proof all sides, 5 metres or 15 strips of Defender® Solar Panel Bird Spike are required. Every Defender® Solar Panel Bird Spike comes pre-assembled with 11 304 grade stainless steel pins. Once installed, these pins act as bars that do not allow the pigeons or birds to push through. As solar panels and solar water-heating systems can be installed on various roof tile shapes, be it a flat tile or a pantile (s shaped), different heights of posts may be needed to fully protect the sides and prevent birds from crawling underneath. The Defender® Solar Panel Bird Spike comes ready assembled in a choice of 4 different metal post heights to accommodate the varying spaces that need pigeon proofing. The base of the Defender® Solar Panel Bird Spike has been designed to position the panel spike as close as possible to the solar panel without touching it. 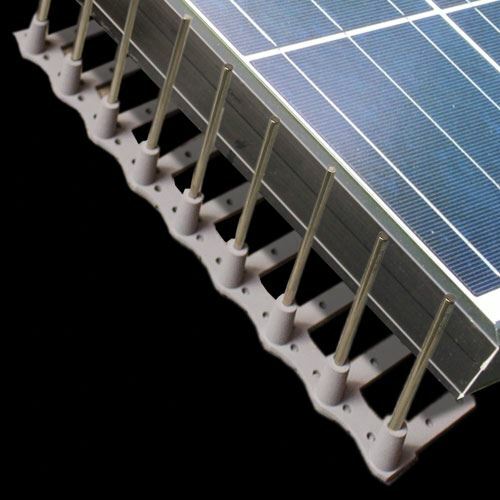 This is achieved by the 11 anti-topple stabilisers, which fit neatly underneath the solar panel’s edge, thereby getting the pins as near as possible to the side that needs protecting. This gives the solar panel spike stability and strength, meaning it will not collapse inwards when pigeons and other birds attempt to re-enter the space under the panel after it has been pigeon proofed. There are an incredible 42 holes along the base of the Defender® Solar Panel Spike, including along the anti-topple stabilisers. These are silicone fixing holes that lock the panel spikes into position. When the adhesive silicone is applied to the base of the Solar Panel Spike, the glue will ooze through the holes, securing it in position. To finish a run of solar panel spikes, it may be necessary to use a shorter strip of Defender® Solar Panel Bird Spike. The base of this spike has 10 grooves underneath, which enable the solar spike to be snapped to size quickly and easily with your fingers. No extra tools are needed. Installation of Defender® Solar Panel Bird Spikes is quick and easy. Simply ensure the correct number of strips have been purchased to cover all exposed sides of the solar panels, and check that the solar panel spikes have the right height pins to provide total protection from pigeons. Apply Defender® Fixing Silicone to the base of the bird spike including the stabilisers, and press it into position with the stabilisers pointing under the panel, ensuring a close fit. However, also make sure the pins don’t touch the sides of the solar panel itself. It is important to check the suitability of surfaces for use with Defender® Silicone. For more information, please visit the product page Defender® Fixing Silicone Adhesive Glue. The Defender® Solar Panel Bird Spike is the newest product in the humane range of Defender® bird solutions. It causes no harm to the birds, but simply acts as a barrier and prevents pigeons and similar sized birds from being able to nest or roost under the solar panels. The Defender® Solar Panel Bird Spike has been constructed from high quality materials that will stop pigeons from gaining access under roof solar panels for many years. The base is manufactured from UV stabilised polycarbonate that can withstand extremes of temperature and all types of weather. It will not become brittle, even in direct sunlight. The 11 protruding pins are made from a 304 grade stainless steel that will not rust or discolour over the years, giving peace of mind that not only do Defender® Solar Panel Spikes pigeon proof your property, but they will continue to look good too. Jones and Son Pest Control Supplies Ltd is a family-run business in Devon, owned by David and Kursty Jones. The Defender® Solar Panel Bird Spike was invented and designed by David, and each strip is manufactured on site to his high quality specifications. Our Defender® Solar Panel Bird Spike has helped owners of solar panels and solar water-heating systems combat the issue of pigeon proofing their properties roofs. Read Solar Panel Pigeon Spike Reviews.